I am a huge fan of using herbs and spices in cooking. I absolutely love them! The judicious addition of just a couple of herbs or spices can elevate a dish from the plain and humble to the extraordinary. Not only that, but herbs and spices can be really good for you – virtually calorie/fat/sugar free and many of them have really positive health benefits too (such as anti-inflammatory and antioxidant properties and even helping people lose weight). As a result I am, to put it mildly(! ), a bit of a herb and spice collector. In fact I’ve just done a count up in my cupboards and discovered I have, ahem, 38 different herbs and spices. However, I realise that not everyone has as many spices in their cupboards as I do. I also recognise that my spices are probably not the best – I generally buy the little pots you get from the supermarket, which I am sure are nowhere near the best quality you can buy AND I often use such small quantities that I am sure most of them are not the freshest. All of this means I was very excited when I discovered The Spicery. The Spicery sells freshly ground, good quality spices by mail order. But better than that, they also sell spice meal kits with all the herbs and spices you need for a particular recipe. They even offer a subscription service, where you can elect to have their recipe kits sent to you on a regular basis. The Spicery was set up in 2005 by a chef called James Ransome who was inspired by a trip to Marrakesh to start a spice business. The business originally began as a market stall at Green Park Market in Bath, where James sold freshly ground spices and spice blends. Customers would often comment that they weren’t sure what to do with the spices and so the idea for a monthly recipe subscription service was born. The mail order business took off and now The Spicery’s customers include many of the best restaurants in the UK. 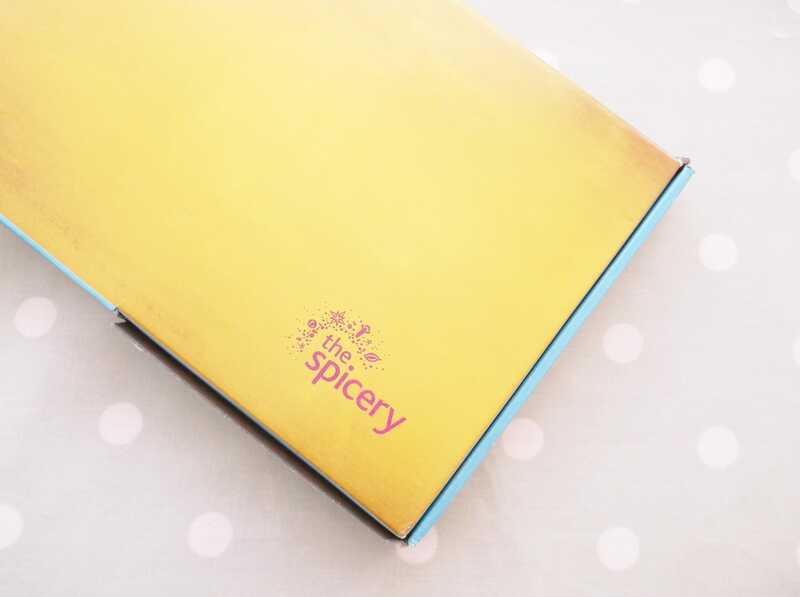 What can you buy from the Spicery? There are 4 options. 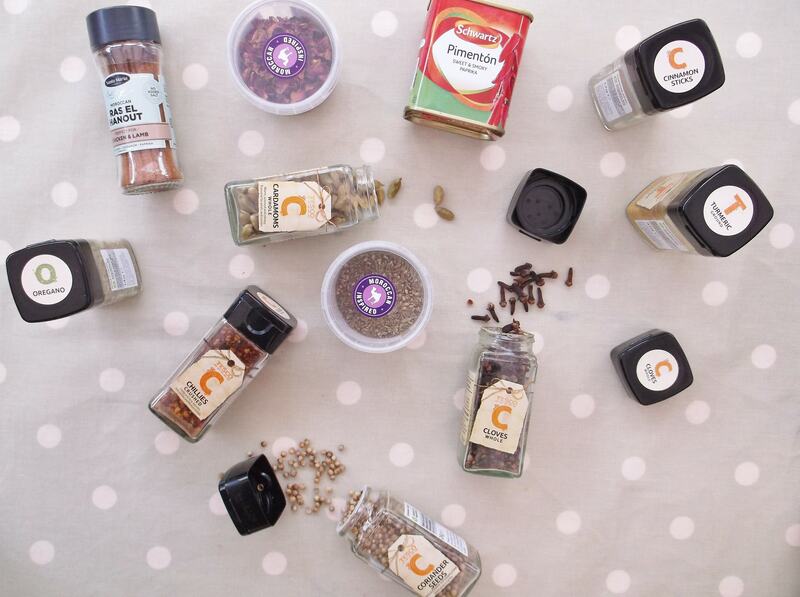 The first is the spice box subscription service, where you are sent spices for a different meal each month. 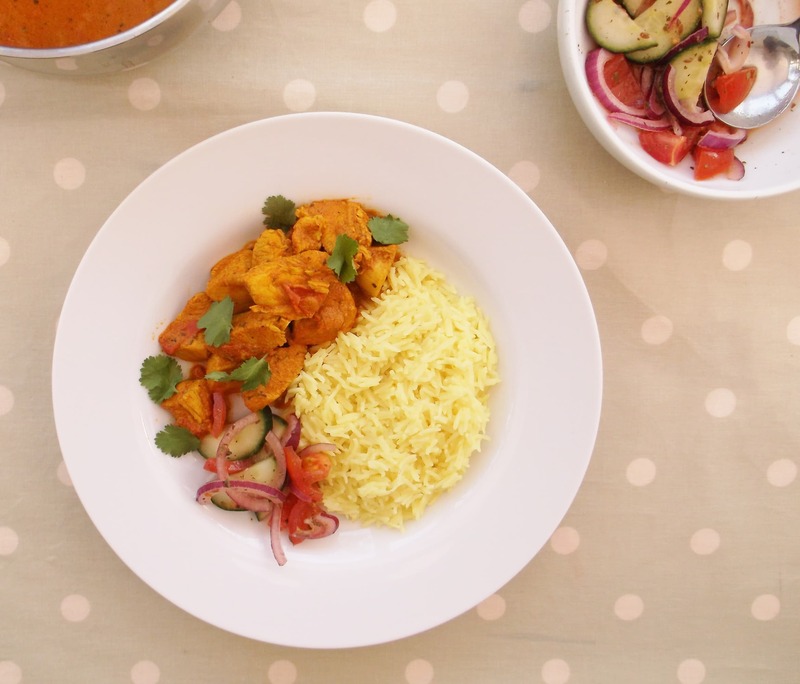 You can choose the length of your subscription (3, 6 or 12 months) and you can choose from various types of subscription: Friday Night Curry, Date Night, World Kitchen, Indian Restaurant Favourites and more. You can choose the theme but you can’t choose exactly what you will get. Each month is a surprise. But you can see what recent boxes have contained to give you an idea of what to expect. Alternatively, if you want to choose exactly what you get, you can go for the second option, which is their recipe kits. Here you can pick and choose exactly what you want from 9 world kitchen options (e.g. Moroccan Tagine or Texan Braised Beef) and 9 curry kit options (e.g. Butter Chicken, Keralan Fish Curry and Aloo Gosht). Whereas the kits you get by subscription are a total surprise, the website gives you a lot of useful information about the recipe kits: information about the origins of the dish, details of exactly what herbs and spices you will get in your kit and even a shopping list of what else you will need to buy (the recipe kits only contain the herbs and spices – you have to buy the other ingredients separately). 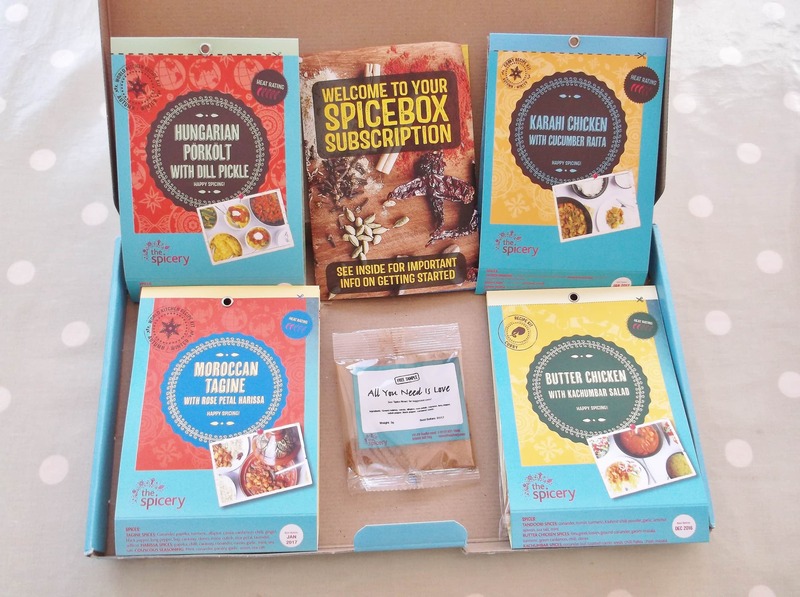 There are also lots of gift options at The Spicery: you can buy a subscription as a gift or you can buy a gift box containing a selection of 4 different recipe kits such as the Adventurous Cook Giftbox or the Family Friendly Giftbox. 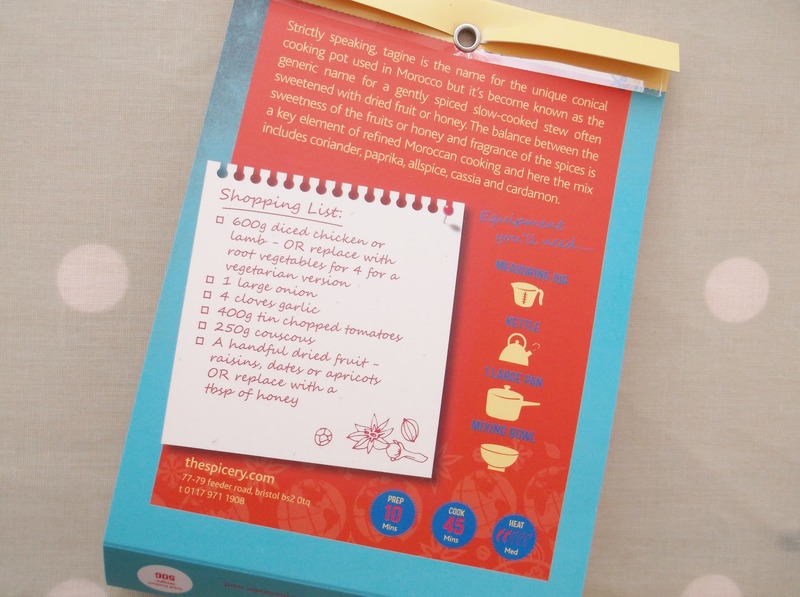 You can also make up your own giftbox from any of the recipe kits available. Finally you can just buy the individual herbs and spices. They have a fabulous array of high quality herbs, spices, chillies, peppers, seeds, flowers and aromatics as well as spice blends such as Garam Masala. This would be a great place to order spices if your recipe calls for something a bit unusual or if you are just looking for fresher, better quality herbs and spices. The Spicery also have a sale page with some great bargains that’s well worth a look. The website is a bit clunky and at times a bit confusing, but once I’d figured out what was what, I was like a kid in a sweetshop (or rather a foodie in a spice shop!) I decided to order some of the recipe kits, as I liked the idea of knowing exactly what I would be getting and what I would need to buy in my weekly shop. As I have two young children I decided to order a Family Friendly Giftbox. 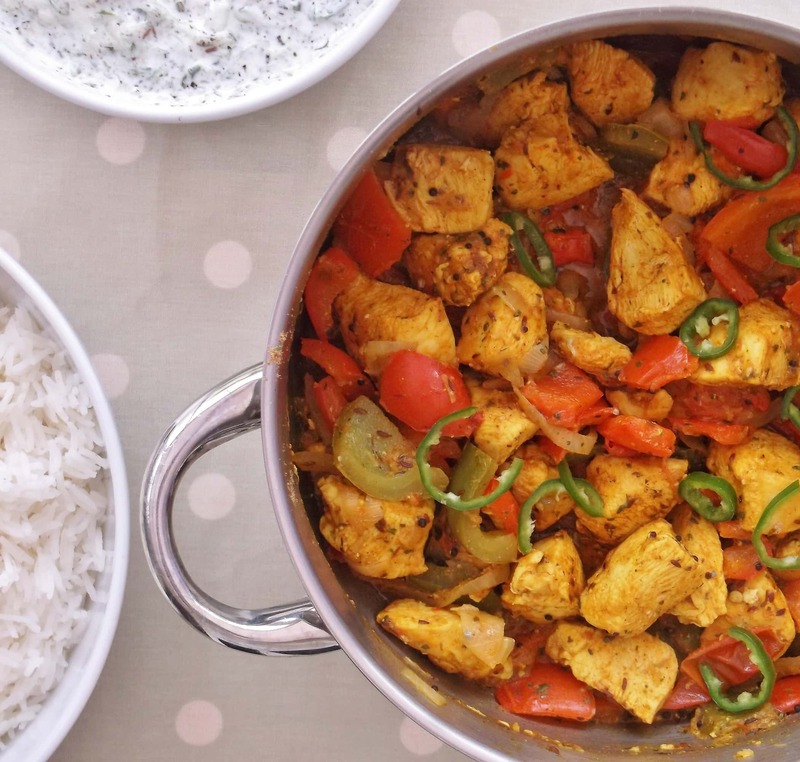 Which contains Butter Chicken (similar to Chicken Tikka Masala, but more authentic), Karahi Chicken (another chicken curry – sometimes called Chicken Korai), Moroccan Tagine and Hungarian Porkolt (similar to goulash). Actually I didn’t exactly order the Family Friendly Giftbox as I discovered that it was actually cheaper to order the 4 recipe kits separately – I assume the giftbox must come with prettier packaging, but since I wasn’t ordering this as a gift, I wasn’t bothered about the packaging. The four recipe kits, when ordered separately cost £10.64. Once I had made my selection, ordering was a fairly simple internet transaction and I eagerly awaited my delivery. I ordered on Wednesday lunchtime and my spices were delivered on Saturday morning. I would have liked a bit more information about this on the website. It wasn’t quite clear when they were going to arrive – I didn’t mind too much, as I was in no particular hurry, but if I was ordering for a particular occasion, this would have concerned me. The spices arrived well boxed in letterbox friendly packaging – meaning you don’t have to be in when your spices arrive. The packaging seemed reasonably robust – there was one small tear on my box, but the contents inside were not affected. Inside were my 4 spice kits. They were beautifully presented in very attractive packaging. On the outside is a picture of the dish you are making, some information about the dish and a shopping list – the kits only contain herbs and spices you need to buy the rest of the ingredients separately. Inside the packaging were several small packets of spice (or herb) blends, the full list of ingredients and the recipe. There are also several other helpful bits of information on the packaging: a heat rating…from 1 to 5, equipment you will need (which is usually kept to a minimum – a saucepan, a jug – nothing too fancy), prep time and cook time. In short everything you need to know in order to make the recipes. These kits are definitely designed to be user friendly. Whereas the website was slightly confusing, the kits are not at all. The recipes are very easy to follow and could be done by all but the most novice of cooks. One thing I particularly liked was that the ingredients on the shopping list are all straightforward – there’s nothing weird you have to track down. This is the first one we tried. We are a big fan of tagines in this house and I couldn’t wait to try this one out. This particular recipe is very flexible. 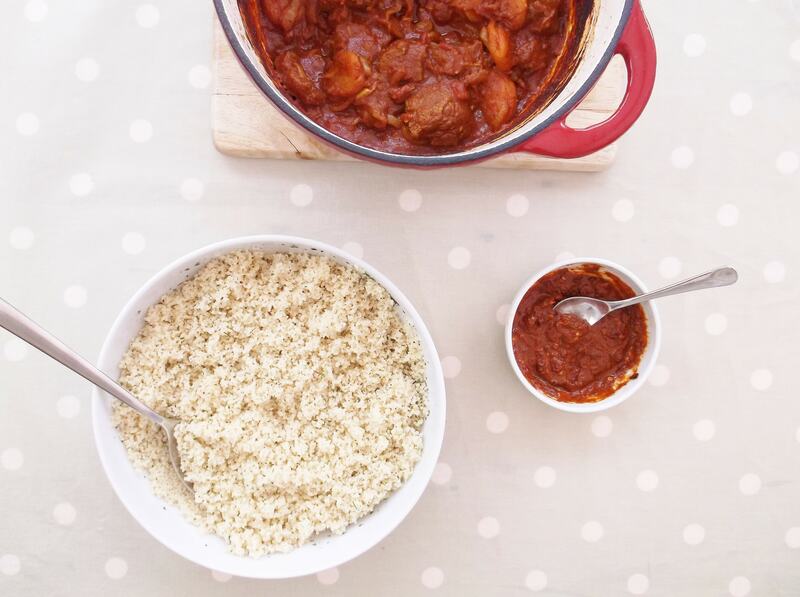 You can choose whether to make this a chicken, lamb or veggie tagine and whether you add apricots, prunes or raisins. We opted to make a lamb and apricot tagine (after the success of the one we tried from Persiana). 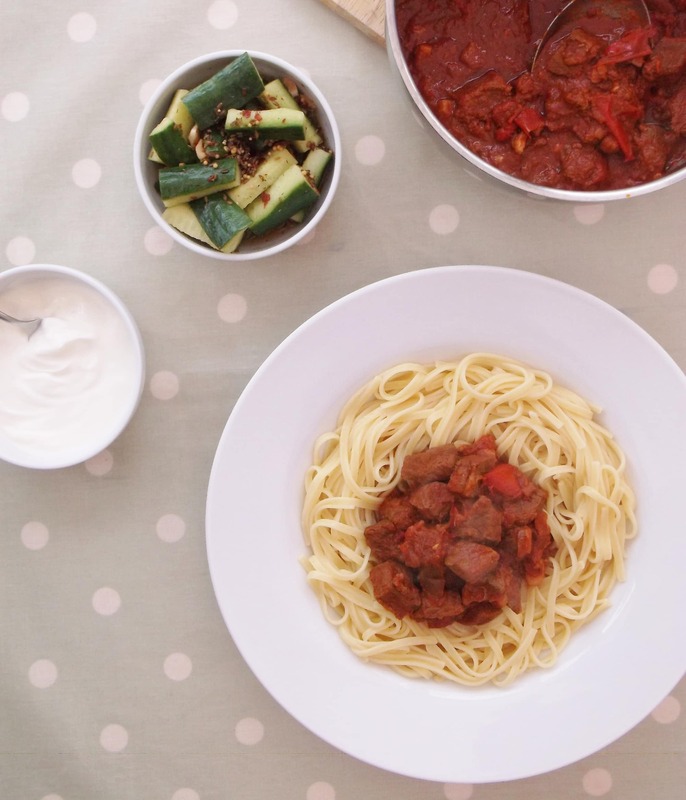 The recipe was very straightforward to make: simply fry onions, add garlic and the spices, add the lamb, add the chopped tomatoes and dried fruit and simmer. Because I was using lamb neck, I popped mine in the oven for an hour to cook slowly. The result was truly delicious – a really flavoursome tagine. The lovely thing about The Spicery is that it isn’t just the main dish that they give you a recipe for, but the whole meal: I had some spices for the tagine, some herbs to put in my couscous and some spices to make into a simple harissa paste. My husband wanted to give me a break in the kitchen on Mother’s Day and so I suggested he did one of the curry kits, as they are really easy to make. My husband is by no means an idiot in the kitchen, but he does like to have a nice straightforward recipe to follow, so he was very happy with this idea. Karahi Chicken is named after the steep sided wok like pot in which this dish would have originally been cooked. It involves marinating the chicken in a blend of spices, then cooking onions and peppers before frying the chicken and finally more spices, tomatoes and lemon juice are added at the end. The kit also comes with a spice mix to add to yogurt and cucumber to make a raita. My one complaint here is the instructions didn’t suggest draining the cucumber and it’s not the sort of thing my husband would think of, so we ended up with slightly watery raita. The kit suggested we serve the curry with basmati rice, which was perfect. The only other thing I would say is, although this was featured in the Family Favourites Giftbox, it is quite spicy. The kids did moan a bit (and they are usually quite good with spicy food). If I was making this again I would put a bit less of the spice blends in or maybe add some yogurt to cool things down. Well, I’m fairly confident I’ve never had Hungarian Porkolt before. It is a beef stew, similar to a goulash, but with less sauce. Again the cooking was fairly simple: fry onions, beef, bacon and garlic and then add spices including paprika (proper Hungarian paprika, that is!). The stew is then simmered on the hob for 30 minutes before adding peppers and tomatoes and then simmering on the hob for a further hour. The suggestion was to serve this with pasta, but I think if I do this again I will serve it with rice or bread. I can’t quite get my head around pasta with this kind of beef stew, though I think it is traditional to serve porkolt with some kind of pasta. The kit also came with spices to make a quick and easy cucumber pickle. I did enjoy this recipe but I wasn’t overwhelmed by it. It was probably my least favourite of the 4 recipes. That’s not to say it was bad, just that the other recipes were amazing and this one was just ‘good’! Also, I’m not a fan of slow cooking on the hob – perhaps it’s my hob but I just don’t seem to get the temperature low enough and consequently the beef was a bit tough. Next time I make this, I will do it in the oven, which is how I usually do slow cooked beef stews. The blurb on the back of the packet says Butter Chicken is a more sophisticated version of Chicken Tikka Masala. It has its origins in Northern India and involves chicken marinated in yogurt and spices, then cooked in a rich tomato sauce. As before, the recipe was easy to follow and the result was delicious. It tasted like a really good version of a chicken tikka masala. The dish was served with basmati rice and a simple salad of tomatoes, cucumber and onions. There was an extra spice packet to add to the salad to give it an authentic taste. This was probably my favourite recipe of the lot. 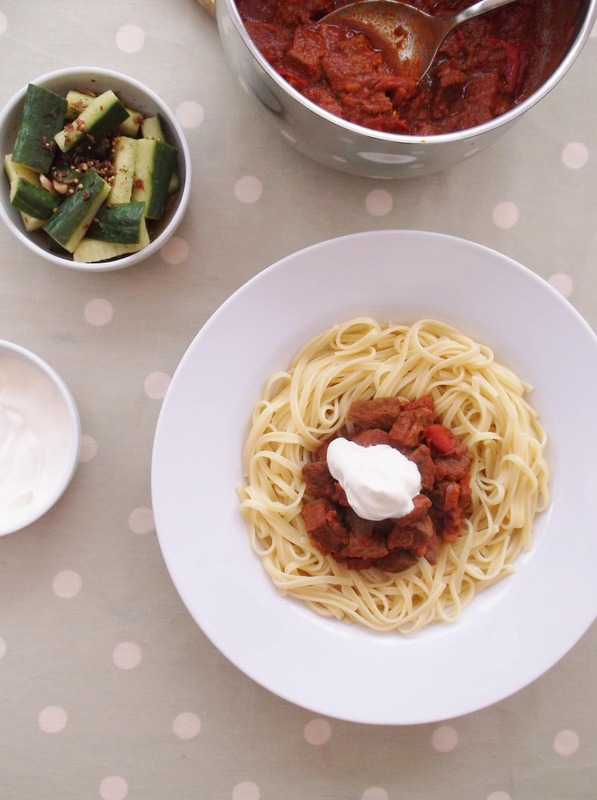 I think I will definitely be sharing a simplified version of this on Easy Peasy Foodie in the future. What’s good about The Spicery? The recipes are really simple and easy to make. All the buying, grinding and weighing of spices has been done for you and so all you need to do is follow the recipe and add the spices in at the right point. It’s a great way to try new dishes and be adventurous, without having to buy loads of pots of spices you may only use once. The spices are really fresh and taste amazing and the dishes are really authentic because they are made using authentic spice blends. All the recipes we had tasted really good and I wouldn’t hesitate to buy the recipe kits again. But the thing I really loved about the spicery was that they give you suggestions for simplified versions of their spice blends, so you don’t have to order the spice blend in order to make the dish again. For example, on the Moroccan Tagine packet they suggest you could make the tagine again using cinnamon, coriander, cumin and paprika instead of the tagine spice blend. Obviously the result won’t be quite the same, but it will be a good approximation. And as a result getting recipe kits is a great was of introducing new dishes into your repertoire. I love how back-to-basics these recipes are. Ther’s no long list of weird ingredients. The only things in the kits are herbs and spices and the only things on the shopping list are basic ingredients, like meat and vegetables. This is essentially cooking from scratch, just with the benefit of someone having sorted out the herbs and spices for you already and I love that. As I’ve mentioned above, the website is a bit clunky and confusing. It takes a while to get your head around it and it does seem a bit geared towards the subscription service and gifting. Similarly, when I received my spice kit, I received a letter telling me how I could redeem my voucher and manage my subscription, which wasn’t relevant. I don’t know whether it was a one off packing mistake or whether they genuinely haven’t got a suitable leaflet if you order a recipe kit rather than a subscription. This is obviously not the cheapest way to eat dinner. Each spice mix came in at about £2.66 and then you have the cost of the ingredients on top. That said, the ingredients were mostly things like onions, garlic and peppers plus a fairly small portion of meat so overall the recipes cost around £10-12, including the spices. 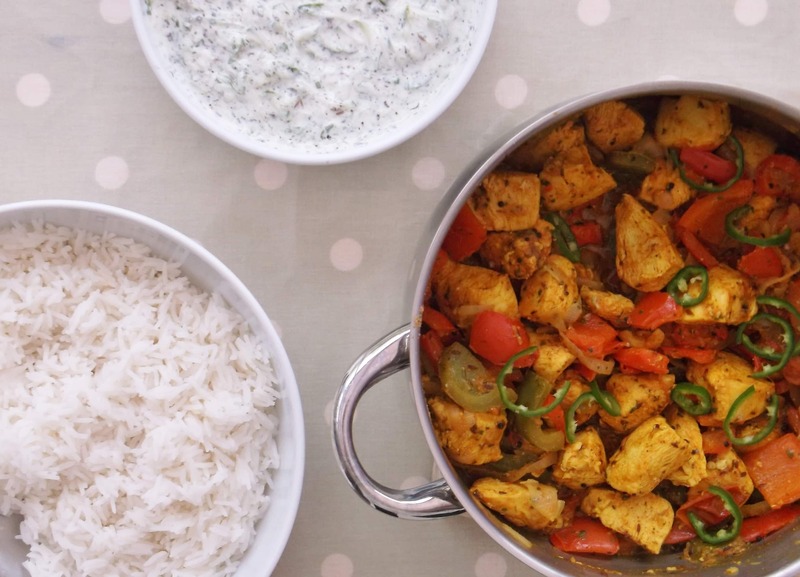 Probably not ideal if you are counting the pennies, but as a weekend treat it would be great and cooking with the recipe kits is way cheaper than a similar sized takeaway. It’s probably not that great for vegetarians. The choice of recipe kits for vegetarians is pretty limited. Although, I don’t think the kits themselves contain any animal products, as far as I can tell (do check if you want to know for sure), so if you don’t mind adapting the recipes it would be fine. And there is also a veggie subscription option. So who is The Spicery perfect for? Anyone who loves using spices in their food, anyone who loves curry and anyone who wants to be adventurous and try new and exciting spicy dishes from around the world but without hassle or faff of tracking down hard-to-find ingredients or following complicated recipes. Anyone who wants to increase their repertoire of interesting, easy to make, delicious tasting dishes. Once you have the recipes you can remake simplified versions of them from spices that are easy to obtain or you may well already own. We will almost certainly be trying out more of these kits as well as working on our own versions of the ones we have already tried. Look out for them coming up on the blog soon! 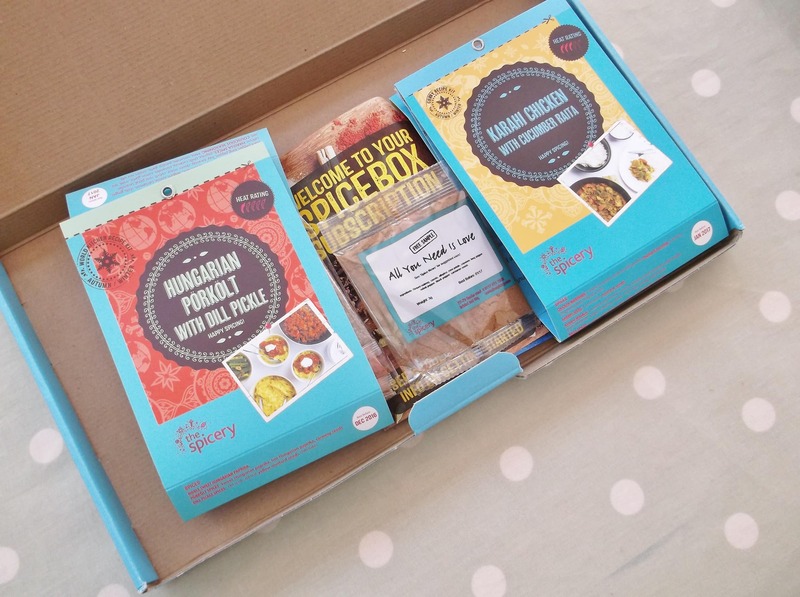 Order your first recipe kit from The Spicery! 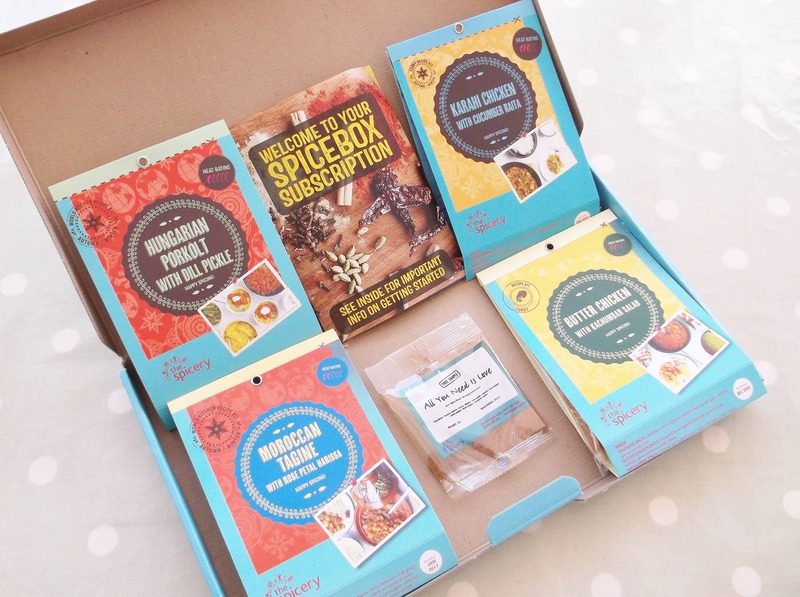 If you want to try a recipe kit from The Spicery click here to be taken to the page where you can order a subscription or click here to go to the bit where you can browse the recipe kits. 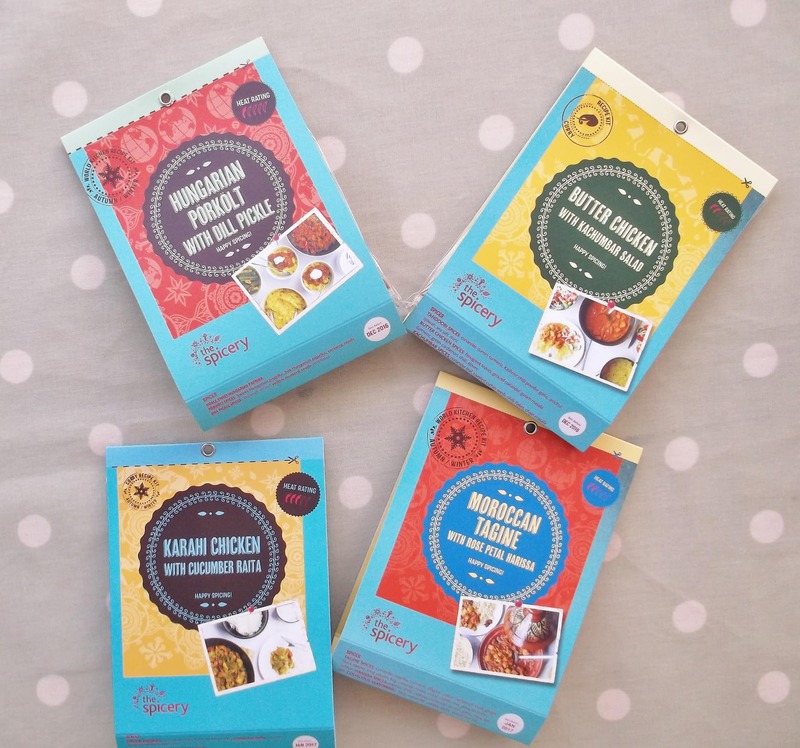 Have you tried The Spicery recipe kits before? What did you think? Let me know in the comments below. 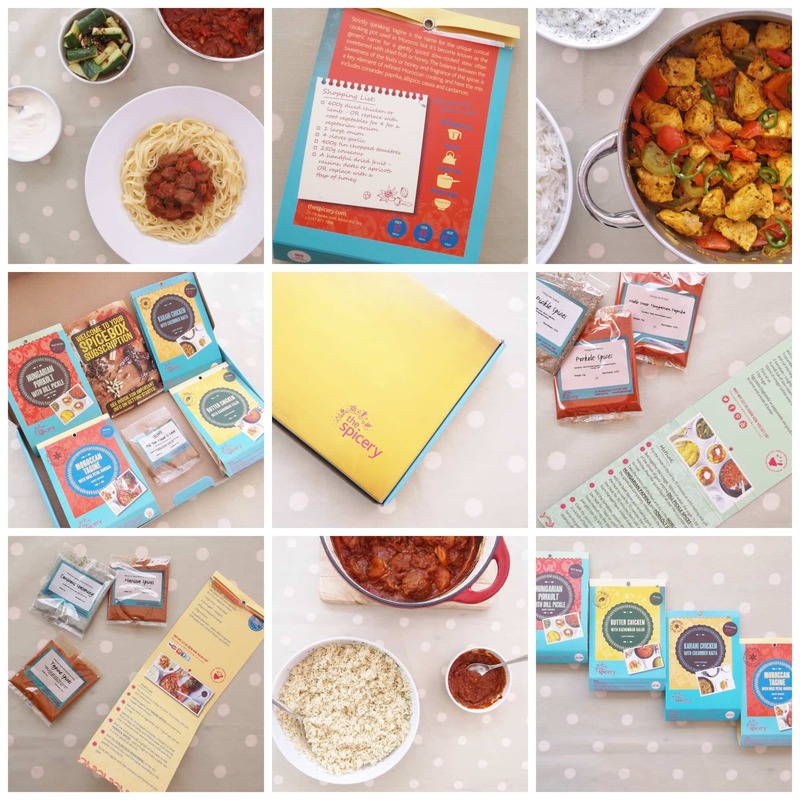 And if any of you do try a recipe kit from The Spicery as a result of this review, I’d love to know how you get on! 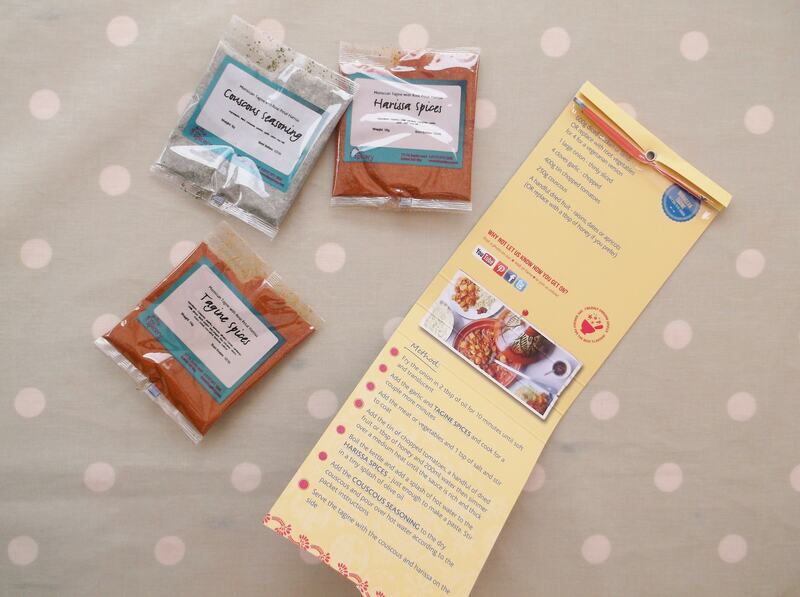 A year ago we were given a 6 month subscription for the curry kits as a Christmas gift. We really enjoyed them too and loved that we always got something extra in with each kit. Although the instructions were clear, some of the kits did involve a bit of organisation though. I remember the rogan josh box involved making the rogan josh, a dahl, a salad, a raita, rice and naan breads! So it was something I saved for the weekend rather than after work! I love the concept of the Spicery Eb, it’s a great idea to allow people to try certain dishes / spices without having to go out and buy a comparatively large quantity of flavours which they may not use again. 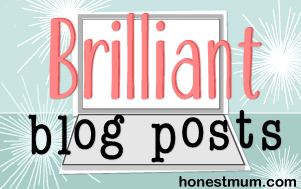 A few months ago I made a dhal recipe which a friend of Mr E’s had shared. To make it I needed to go out and buy 4 other spices which we’d not already got in our spice/herb collection. I’ve only used those spices once or twice since. Thanks for sharing.